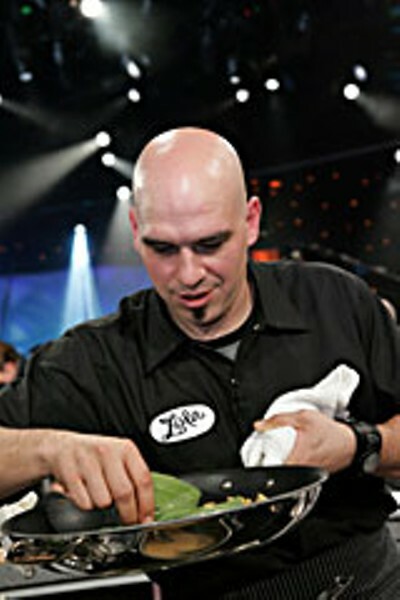 Michael Symon, winner of the Next Iron Chef, and other Iron Chef contestants. My wife Beni was in Cleveland recently, where she dined at Lola, a cutting-edge restaurant owned by Chef Michael Symon. Several years ago, we read a biographical sketch of the young Symon in Michael Ruhlman's book The Soul of a Chef. When Beni returned, having had a spectacular meal, and having met Symon (she bore photographs and an autographed menu), I sat down with her and vicariously re-ate the meal. A day later, she was reading the paper and saw that a program called The Next Iron Chef was on that very evening, and that Symon was one of the finalists! This was awkward — we almost never watch TV, save for an occasional sports event. And I've particularly avoided The Food Network, which trivializes things I take seriously and substitutes show-biz and "personality" for real content. The Iron Chef is one such program. The original was a typically eccentric Japanese TV series, which had kung-fu elements integrated into an actual cooking contest. Its campy charm, which came to attract American audiences, derived in part from the dubbing of the rather over-the-top Japanese dialog into English, reminiscent of the Godzilla and martial arts movies of the '70s. Elaborate production values helped the original show, with "conspicuous consumption" of expensive delicacies, such as caviar and truffles. One chef bragged about using 1,000 pounds of crab merely to flavor his asparagus dish. The cult hit show was adapted into an American format in 2005, and has since had five series, each featuring a Food Network personality as "Iron Chef," most recently Bobby Flay. In each episode, a new challenger chef "battles" one of the resident Iron Chefs in a one-hour cooking competition based on a theme ingredient. It is hard, frankly, to take this stuff seriously. The resident chef has a huge advantage over challengers (though less than the Japanese original), and the show conceals many elements that should be open — for example, the fact that each chef has two assistants of his/her choice. (Well! Give me Thomas Keller and Charlene Rollins, and I'll go up against any chef in the country.) Much that is presented to the viewers as a "surprise" is known by the participants in advance. And there are other technical inequities I'll forgo. Nonetheless, the American show has become huge, a culinary game show, especially popular with the critical U.S. advertising demographic of 18-to-36 males. This may be because the showis promoted as more of a sporting event than a cooking show. And that's why it has not been of keen interest to people seriously involved in food. However, the Next Iron Chef series was to be something new — a true contest of actual working chefs, to select the new star. We discovered that the entire series was running that Sunday, with back-to-back episodes from 4 in the afternoon to 9 at night, with The Next Iron Chef being crowned at the conclusion. The contest was presented as an elimination process (in place of "head-to-head" competition), with serious tests and a panel of expert judges. And so it came to pass that we, the "No TV" couple, spent six hours glued to the screen. It immediately became clear that this show, while retaining much of the phoniness and commercialism I associate with The Iron Chef, was something more. For one thing, it matched established chefs, not personalities. For another, it was a progressive elimination process rather than the confrontational one-on-one format. There was also a serious production budget, not simply for showbiz values, but for cooking, including expensive new devices such as the "thermal immersion circulator" (a method called "sous-vide") and the "Paco jet." Judging the competition: Michael Ruhlman, the author mentioned above; Donatella Arpaia, owner of two Manhattan restaurants; and Bon Appétit restaurant editor Andrew Knowlton. All three were, shall I say, "beautiful people," youthful and trim, faultlessly groomed and coiffed; all sophisticated diners. None had been a working chef, but that did not deter them from holding strong opinions. They were buffered from the chefs by the host, Alton Brown, the main commentator on Iron Chef America. Brown is an actor, a Food Network mainstay (host of a couple of shows), author of several cookbooks and, like Ruhlman, a Culinary Institute graduate. Challenge 1 was "Speed." Debone a chicken, fillet a salmon, open enough coconuts to produce two cups of coconut juice, shuck six oysters and clams, french a rack of lamb and slice a 4-inch strip of daikon radish thin enough to read newsprint through, all in a 15 minute time limit. Challenge 2 was "Artistry." Two desserts: one with any available ingredient and the second featuring savory ingredients. An interesting twist was that the chefs were not allowed to use butter, sugar or cheese in their desserts, unless they made it themselves, from various raw ingredients, including milk and fruit. Based on their order of finishing in the first round, each chef selected one of the following savory ingredients: catfish, tripe, beef shoulder, chorizo, duck confit, bacon, salmon roe or squid. Amazingly, tripe and squid were chosen, and both integrated into convincing desserts. Ninety minutes. Here, the renowned Traci Des Jardins (Jardiniere of San Francisco) fell from grace. Following contests featured themes titled "Simplicity," "Innovation," and "Resourcefulness" — a killer episode, in which each chef selected ingredients which were then sealed in a freezer, then assigned to another competitor. Finally, everything had to be cooked outside on a Weber Grill! Next, "Airline food," which notwithstanding the product-placement and commercial tie-in with Lufthansa, entertainingly addressed the multitude of problems attendant upon that peculiarly doomed branch of cuisine. Finally, something one might call "An American In Paris," in which French dignitaries were invited to dinner at the American Embassy, to taste a meal exemplifying American food. The level of creativity in this stage was extraordinary, with ethereally elevated versions of chicken-and-dumplings, veal meat loaf, "root beer float," strawberry shortcake, Philly cheese-steak (the "cheese" actually a burata made of mozzarella and cream) and a "hot dog" made from French langoustine (lobster). By the end of that one, the original eight contestants were pared down to two. The final competition was moved to the vast "Kitchen Stadium," a Tokyo arena in which the original Iron Chef series was filmed. The Next judges were abruptly replaced with three previous American "Iron Chefs," and the final competition was done in true Iron Chef fashion with the chefs creating six dishes based on a whole swordfish. In deciding the overall winner, however, all six judges had ballots. The last dish, one more than required, was improvised in the final minute of the trial, when Besh heard the Japanese judge, Chef Morimoto, ask if anyone was going to make a swordfish dessert — it was an extraordinary display of summary virtuosity, although hardly a distinguished dessert. Moreover, looking at the menus, Besh's looks superior in imagination to Symon's relatively safe choices. But nothing is ever quite so simple. There is now a controversy, fueled by two of the regular judges, who thought Besh should have won. Well, hooray! It is nothing but good news when we have a cultural dispute more interesting than who will start at quarterback for the Raiders. Chef Michael Symon fights a "Thanksgiving Battle" this weekend on Iron Chef America. Could turkey be on the menu? Joseph Byrd will be watching. He thinks the judges made the right choice. Don't agree? Set him straight ateat.your.spinach@gmail.com.